Hello Friends, I hope you are doing well. I was excited about working with some gorgeous floral prints, I mean G-O-R-G-E-O-U-S! The florals from Benartex’s Rosemont Gazebo have a very English feel to it, very Lady Carlyle-ish [click here for my Lady Carlyle post] if I may say so myself. I have named the quilt in honor of one of my favorite cousins. I used to want to grow up to be just like Priscilla when I was a kid, and I still want to grow up to be just like her. 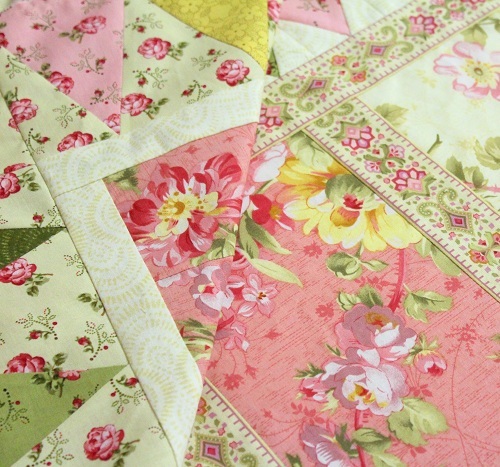 Priscilla grows the most beautiful garden, and so, I am imagining if she were to have a garden party, it would have a color palette similar to what’s on the quilt! What do you think of these sweet, dainty and elegant floral prints? And whom would you like to be when you grow up? Thanks for stopping by. It’s back to work I go! I am responding to comments/emails tonight — you might just hear from me. :) Hugs to you all! This entry was posted in Quilting, Quilts & Projects: Upcoming and tagged Benartex Rosemont Gazebo. Bookmark the permalink. Oh, I love the pinks!! There are many flowers in my garden that are pinks and yellows like this fabric. There is a lady in my sewing group who is 79, she travels, makes beautiful applique quilts, is pretty computer savvy and ……has a fabulous sense of humor and a heart of gold. I want to be like her when I “grow up”!!! Oh, wow! It does look like your china! This is gorgeous! I loved it from the first glimpse! Oh wow – those ARE gorgeous! There are qualities from several friends and people I look up to that I’d like to emulate, but I can’t think of any one other person I’d want to be when I grow up. Yes, these prints call to me. So pretty! How terrible am I? I don’t care for these prints. I’ve never been fond of florals because they make me think of Victorian homes, also something I’m not fond of. Give me a simple, geometric design, with some asymmetry and a circle or two, and I’m gushing. Sorry… but you asked. :-0 I want to be beautiful when I grow up. Maybe look like Angelina Joli?